Approximately fifty miles (80km) from Miami, Grand Bahama is an idyllic island of white beaches and aquamarine seas beneath which vivid coral reefs teem with life. Most visitors to Grand Bahama stay in Freeport, a few miles inland, or at the seaside suburb of Lucaya on the south coast of the island. Here you can sail, play golf or simply relax by the pool at one of the many all-inclusive resorts. In Freeport there are plenty of boutiques and bazaars to tempt shoppers, and evenings can be spent at one of the many restaurants. Following on from this, travellers with cash left in their wallets can head to one of the island's casinos. Outside of Freeport, nature lovers will find themselves in their element. 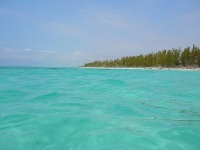 Between Sweeting's Cay and Pelican Point, are seven marine caves inviting exploration, and a little further west is Deadman's Reef, accessible from the powdery white beach at Paradise Cove. East of Freeport is the Lucayan National Park which is home to the largest underwater cave system in the world and an experience coveted by those seeking new thrills. Visitors can enjoy the island's natural flora and fauna, or hire a kayak and explore the mangrove creeks. Owing to its beauty and variety, Grand Bahama has become one of the most popular stops for Caribbean cruise liners, so visitors can expect a constant coming and going of tourists on the island.